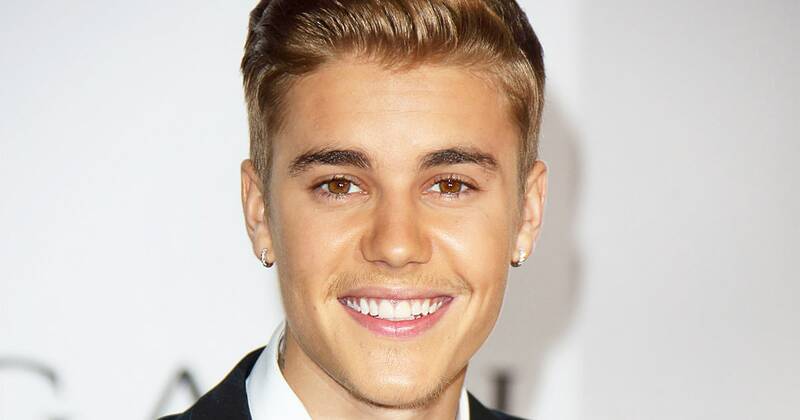 Adding to the list of rich foreigners who are buying land in New Zealand is singing sensation Justin Bieber. Fresh off a tour of NZ, during which he tweeted his love for the place, the ultimate Bielieber has entered negotiations to buy a substantial tract of land at Glenorchy, near Queenstown. 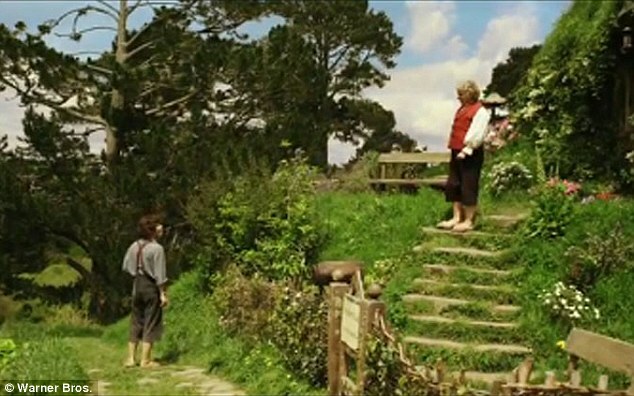 The property includes various film sites from The Lord of the Rings and The Hobbit movies, and is where many Lothlorien scenes were shot. “What the world doesn’t know is that Justin is a massive Lord of the Rings fan – but the movies only, not really the books which he’s never read,” says a source close to the singer. “Although he knows about Tom Bombadil, he thinks he’s hilarious. He’s seen some Bombadil fan videos online and he wants to create his own, but using these woods that appeared in the films. 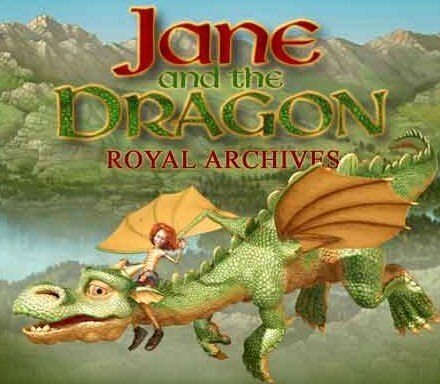 Fans of J.R.R. Tolkien will recognize that the ‘Sil-merryland’ almost certainly refers to J.R.R. Tolkien’s The Silmarillion, an epic compilation of stories recounting, in part, the struggle of the peoples of Middle-earth against the dark lord Morgoth. “Getting the film rights was apparently going to be a major hurdle” said the source. “‘Impossible’ and ‘a real long shot’ were overheard quite often.” But apparently Justin hopes to use his considerable influence to sweet-talk some of the members of the Tolkien family and Tolkien Estate who are huge fans, and devoted Bieliebers, to release at least limited rights to some of the Silmarillion stories. Regarding possible roles for Bieber, one can only guess. Given that his physique doesn’t lend itself to playing the rotund Tom Bombadil, and Bombadil doesn’t appear in The Silmarillion anyway, fans can only speculate that it would have to refer to some other major role. Given Justin’s rather elfin features, the roles of the heroic Fingolfin, or even the proud Feanor come to mind. The mention of “growing acceptance of gender neutrality trends” was reportedly also overheard by our source, so the roles of Luthien or Melian can’t be ruled out completely. 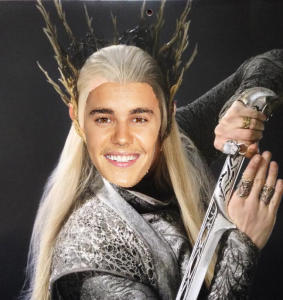 Meanwhile, if the Queenstown land purchase goes ahead, the Mayor of Queenstown Lakes District has promised to name Bieber as an official inhabitant of Middle-earth. “I’m sure I can get Peter Jackson down here to dub him with a replica of Anduril – the guy owes me a favour for having to muck up all the horse poo he left behind after filming the charge of the Rohirrim,” says the Mayor. Eagle-eyed Ringers spotted Royd Tolkien in the Desolation of Smaug Extended Edition. You can see him here in this scene between Gandalf and Beorn discussing the tombs in Rhudaur. Is Elijah Wood actually in The Hobbit 3? Warner Bros.’ latest presser adds new uncertainty. Late last month, Warner Bros. put out a new, updated one-pager press release for The Hobbit: The Battle of the Five Armies. Within it was a new cast list with one interesting, and very obscure, addition, and one even more interesting exclusion. 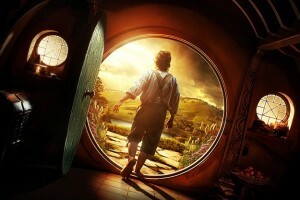 Posted in Casting Rumors, Elijah Wood, Green Books, Headlines, Hobbit Movie, Ian Holm, Studios, The Hobbit, The Hobbit: The Battle of Five Armies, The Hobbit: The Battle of the Five Armies, Warner Bros.
How would have Peter Jackson’s The Hobbit looked as a duology? 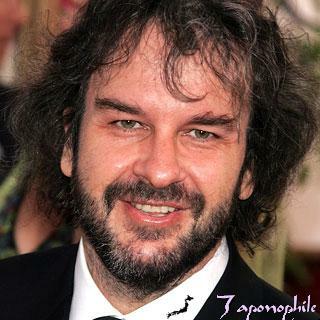 Originally, Peter Jackson intended his adaptation of The Hobbit to be a two-film effort — a duology. We’ll never know for certain how it would have turned out, but in this feature TORn writer Captain Salt brings together the known facts to give us some idea of just how it might have shaped up. 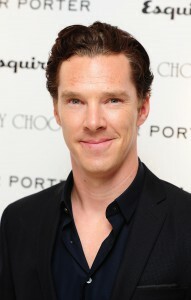 Benedict Cumberbatch has just officially been announced as attending the 2014 Oz Comic-Con. WELLINGTON — The great cities of history have risen up around rivers, lakes and on coasts. Water holds vast and replenishing stores of food, improves transportation of people and goods, encourages trade, and of course keeps a population hydrated. Paris. London. Hong Kong. New York. Tokyo. Moscow. Boston. On and on. Lake-town benefitted from excellent transportation and presumably a wealth of fish and food and clean, fresh water but it was built on water for a different reason. One dragon in particular: Smaug The Terrible. Tolkien’s Lake-town, like real-world Venice, was built on wooden pillars sunk into water. The lake men — with the destruction of Dale seared forever into their memory — built on water for safety. We watched it in the prolog of “The Hobbit: An Unexpected Journey,” while they had to live with the fear of dragon every day. Water-based living provided at least a chance against the great and terrible worm if he ever attacked again. Beginning last Saturday and running through to September 4, TheOneRing.net is hosting a Pledge Drive (see the banner at the top) as well as a bunch of auctions for some really cool memorabilia and collectibles. The day-to-day operation of the website, and the events we host, require a lot more resources than when we first started nearly 15 years ago. We sometimes find it hard to ask our readers for the help we need to keep running, so we began discussing what it is that makes TheOneRing.net worth helping out. It started out as a search for the Top Ten Moments of TORn, but the list got so long because each staff member had their own idea of important moments in TORn history. Here, instead, is something more encompassing: Ten Ways TORn helps serve Tolkien and Lord of the Rings fandom (listed in no specific order). And, if you enjoy what we do, consider a donation (no amount too small, because every bit does help!) to keep us running! If you can’t, that’s fine as well — keep reading, commenting and contributing. Because TORn is as much you as it is us! If you’ve ever sent in an article, submitted a photo or report, posted on our messageboards, visited our chat, or commented on our twitter, facebook or g+, you’re the reason TheOneRing.net is among the largest and most-respected pillars of the Tolkien community on the web. 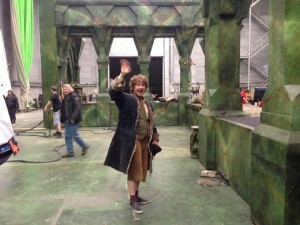 Martin Freeman waves goodbye on his last day as Bilbo Baggins. “Tonight Martin Freeman finished his last shot as Bilbo Baggins. The end of an incredible two and a half years. I cannot imagine anyone else in this role – a character that Martin has nurtured and crafted with love and great skill. 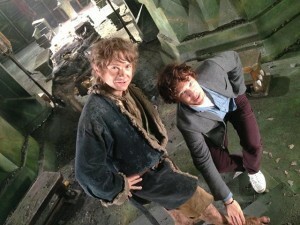 Martin Freeman as Bilbo with Benedict Cumberbatch. Soon after, Jackson followed up that post with a somewhat historical shot of Freeman as Bilbo with Benedict Cumberbatch, famously his partner in their Sherlock Holmes television series. The two also figure prominently together in the next Hobbit film as Cumberbatch performs the massive dragon Smaug from his performance capture suit and has a key exchange with Bilbo. 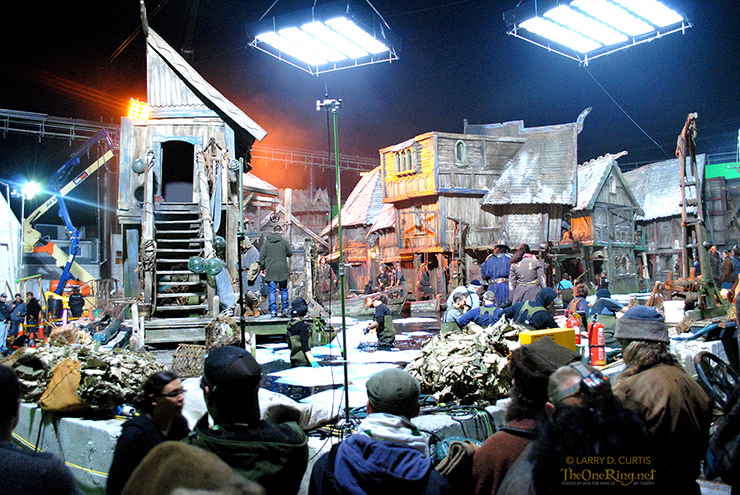 When behind-the-scenes content rolls out after the film, there may be more of them together on the Hobbit films but little has been seen so far. With the performance capture role, there could be precious little of the two actors together in New Zealand. All reports and word from Jackson indicates there will not be pickup shooting next year but Jackson had a period of these after ever LOTR film and it is tempting to suggest there will be more next year. But with such a large principal cast, such an effort might be impossible because of scheduling. Still in Wellington are the Company of Dwarves which could mean a heavy dose of battle scenes as audiences will want to follow each of them in battle. The book plotting calls for ferocious and deadly action. Luke Evans, playing the enigmatic Bard the Bowman in “The Hobbit: The Desolation of Smaug,” also tweeted that his last day on the film is over. Evans’ Tweet suggests he is off to work as Dracula after a summer where his “Fast & Furious 6” did big business at the box office. Graham McTavish also tweeted his farewells to Freeman. Jed Brophy (Nori), Adam Brown (Ori) Mark Hadlow (Dori), Dean O’Gorman (Fili) Aidan Turner (Kili) John Callen (Oin), Peter Hambleton (Gloin), Stephen Hunter (Bombur), William Kircher (Bifur), James Nesbitt (Bofur), Graham McTavish (Dwalin). Also Sylvester McCoy (Radagast the Brown) will be there doing a panel and is signing autographs all 3 days. Resident hot dwarves Aidan Turner (Kili) and Dean O’Gorman (Fili) will be signing and hosting photo sessions individually on Sunday only. So, we went to the new Star Trek movie last night at Roxy Cinema here in Miramar, Wellington and when we came out a statue was sitting in the middle of the foyer which either we missed or was put there during the movie. Not saying it’s Smaug or anything, but I took a picture for you to make your own mind up about it! We are including the image after the break in case you don’t want to be spoiled and this is actually Smaug from “The Hobbit: The Desolation of Smaug”! Do we think this is Smaug? 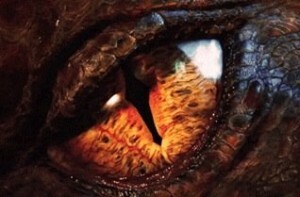 If you look closely at the eye in the picture and compare it to the eye from the end of “An Unexpected Journey” there could be similarities, but ultimately the fact that this statue is existing for all of the public to see right now in Wellington, makes it highly unlikely this is the real thing. That would just be crazy! If you are in The Roxy soon, snag some more pics and send them our way! It was an interesting journey the filmmaker and Hobbit actor Jed Brophy took us on in one hour, we where guided along the stages and rooms of Park Road Post in Miramar, Wellington, to where we finally ended up in Peter Jackson’s’ home away from home the editing room in his traditional bare feet. Jed was a great host along side Peter Jackson who explained certain things on the way to the editing room, we saw snippets of work in progress, Azog and an Orc in motion capture, some Pre-Viz of Smaug the Dragon, of whom we only saw snippets of in The Hobbit: An Unexpected Journey, which is akin to the unfinished Gollum in his first but brief appearance in Fellowship of The Ring, before he was fully realized as a digital character in the Two Towers, he was a mere shadow of himself you could say..